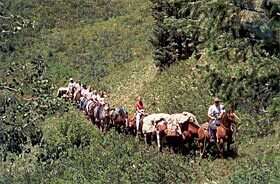 Pack Trips & Camps at Teton Mountain Ranch -Teton Valley, Eastern Idaho. Two hundred miles of trails are accessed from our base camp in North Leigh Canyon. Riders of all levels can explore both the high country and remote backcountry and enjoy majestic views of the peaks and glacial lakes. After a full day of riding, return to your snug camp and enjoy delicious Dutch oven dinners, a blazing campfire and the camaraderie of new friends. This high altitude base camp, packed in by horse string, is located just off shore of a glacial lake, deep in the back country of the Jedediah Smith Wilderness. We’ll ride through wildflower-studded meadows, cross mountain passes, and see remote areas of the Grand Tetons. You’ll enjoy delicious Dutch oven dinners by a blazing campfire. Here’s a chance to saddle up with your favorite cowgirl/cowboy and share the high country trails of the Grand Tetons. Day rides explore the country of Targhee National Forest and the Jedediah Smith wilderness, returning each evening to enjoy Dutch oven cooking, blazing campfires and the camaraderie of friends. This is a progressive camp where we will travel into the Palisade Mountains south of Teton Valley. At one point we will view Teton Valley, Jackson Valley and Swan Valley at the same time. We’ll enjoy beautiful upper Palisades Lake, mountain streams, mountain passes and view the rugged mountain canyons. We’ll end the trip in at the lower Palisades Resevoir near Swan Valley. Gals, need some time in the quiet of the back-country?? This is the trip for you. This is a progressive camp in the Palisade Mountains south of Teton Valley. You’ll get acquainted with your horse as it carries you through the forest, by beautiful lakes and streams and over mountain passes. You’ll enjoy the fresh air, peacefulness of nature and the crackling campfire with good food. A $300 non-refundable deposit is required to reserve your spot. The balance is due no later than 45 days prior to the first day of the trip. Personal checks are acceptable. The deposit is nonrefundable. If you must cancel after having paid the balance, we will refund this money if we, or you, can find a replacement. Otherwise, we will give you credit toward another trip. If Teton Mountain Ranch cancels, we will refund all monies paid. Guests are strongly encouraged to purchase trip insurance covering cancellations, interruptions, trip delay/missed connection, lost baggage, accident & illness. Consult your personal agent, travel agent, or call Travelex 1-800-228-9792 for details. Average cost is $67 to $87. Teton Mountain Ranch Copyright©2011. All rights reserved.